Visitor Area 4, located at Ferst Drive and State Street, is the closest parking to the building. The parking fee is $2/hour. 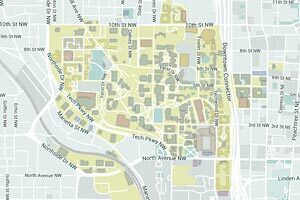 Click here for a map of all parking on campus. Georgia Tech's complimentary shuttle, the Tech Trolley, provides guests transportation arriving and departing from the Midtown MARTA transit station, the Georgia Tech Hotel and Conference Center, and MARC. The Tech Trolley will run 5:45 a.m. until 11:30 p.m., Monday through Friday at 4 minute intervals, Saturday, 10 a.m. to 6 p.m., and Sunday, 3 p.m. to 11 p.m.
For a map of the shuttle's locations and real-time arrival information, click here. For a listing of hotels near the GT Manufacturing Institute, please click here. For more information please fill out the form below or call our offices.